House Plan News – House plans you love. And builders prefer. Besides the kitchen, the master suite is considered one of the most important areas of a home. It’s where you’ll be spending a good portion of your life, not only because it’s where you and your significant other sleep, but where you get ready for the day ahead. Taking the time to design a master suite that best fits your needs is well worth the effort. With a few design tips outlined in this article, you’ll be on the right path to creating a well-planned master suite. Because your master suite will act as a retreat from the hectic world, a sense of privacy should be woven into the design. Positioning these rooms near the back of the home and/or on the upper story is recommended. The privacy issue also comes in to play when locating windows and doors. Yes, you can add curtains or blinds, but it’s comforting to be able to dress and undress freely without having to worry about putting on a show for the neighbors. The master suite most commonly consists of the largest bedroom and bathroom in the house. Larger walk-in closets and sitting rooms are also popular features for these areas. When designing your home’s floorplan, assigning a generous percentage of the square footage for the master suite is advised. One should also consider the furniture that will go in these rooms. The size of the bed, dressers and sitting room chairs can help determine the amount of space needed. Closet space. More is more. One of the most attractive features of a well-designed master suite is ample closet space. If the square footage is available, including two walk-in closets is the best course. This allows enough room for both occupants to keep their individual wardrobes. A master suite with two walk-in closets is also a huge advantage when selling your home. While the rest of your home’s bathrooms are purely functional in nature, the master suite bathroom can be extraordinary. Beyond function, this bathroom can be a place of relaxation. Double sink vanities, spa tubs and steam showers are just a few examples of luxurious master suite amenities. Since the master suite is usually inhabited by two people, it will generate a significant amount of clothing and bedding. To conveniently handle the cleaning and upkeep of these items, designing easy access to the laundry is suggested. If the master suite is on the second floor and the laundry room on the first, a laundry shoot is a feature that can aid the accessibility and save time. Every great home should have a master suite to match. As your own personal escape from the busy world, it should include the space and amenities that will enable both functionality and relaxation. As much if not more than any room in your home, the master suite should be a reflection of your style with the space and features that will complement the home as a whole. Similar to an airlock on a space station, the mudroom is a vital transition area between the outdoors and indoors. Coming in from outside, it’s a place to take off and store your outerwear and other daily belongings. When leaving your home, it’s the last stop to gear up with the needed essentials. Coming or going, a well-designed mudroom is an essential part of any home. One of the keys to a properly designed mudroom is making sure it’s located adjacent to the most used entry way. Consider what door your family will be using the most often and that is the place for the mudroom. This is probably the area where everyone’s shoes, boots, gloves, coats, backpacks, keys and hats will live. So, it should be designed into the floorplan according to convenience and easy access to your home’s most popular doorway. Accessibility and organization are two very important components to a functional mudroom design. Built-in shelving and cabinets are nice for storage. While racks and hooks to hang coats and hats make getting in and out of the house more efficient. If there is room for a bench, not only will it provide a comfortable place to sit while removing shoes and boots, but with the right design, the area under the bench can be utilized for storage, as well. Installing a small mirror is also a nice amenity, for a last-minute look before you head out the door. four-legged family members, you’ll need room for a leash and outdoor toys. If there’s space for its own room great, but a mudroom can be designed into a hallway, laundry room or larger closet. The very definition of a mudroom describes a place where muddy and wet clothing is taken off before entering the rest of the home. It’s there to protect the rest of your home from the outdoor elements. With that, a mudroom should be designed using materials that can handle dirt and moisture. Tile flooring or an easy to clean rug will help keep things tidy. Metal hooks and wire baskets are also moisture resistant features that make for durable storage and organization. All told, the mudroom should be designed for function. It is a place to keep outdoor clothing and any other daily items used outside the home. But just because the mudroom is designed for utility, doesn’t mean it shouldn’t be attractive and complement your home. Incorporating the same color pallet and material styles will help weave this room into your home’s established décor. 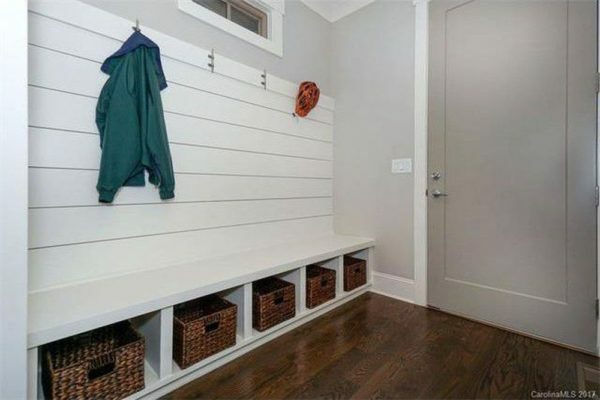 Yes, it is a mudroom, but it can be a beautiful room, as well. Gaining popularity in the early twentieth century, the Craftsman style house is easy to identify. Its distinct design characteristics set it apart from most other home styles. From its iconic front porch, exposed beams and grand fireplace, the Craftsman home has a character all its own. If you’re planning to build a new Craftsman home, this article will highlight a number of its classic design features. Of all the defining features of a Craftsman home, the covered front porch is one of the most recognizable. Anchored with brick or stone footers, Craftsman porch columns start wide at the bottom and taper toward the top. The front porch has deep overhanging eaves, visible knee braces and exposed rafter tails that extend beyond the roof line. Shingled eaves and handcrafted trim are also a notable detail found on examples of the style. Balanced proportion and scale are very important qualities of a Craftsman home. Standing vertical but solid, most Craftsman’s are only one or two stories. Their low-pitched roofs provide a squat facade which works proportionately with their wide floorplans. Intersecting roof lines also help to convey a textured dimension to the home when viewed from every angle. Another hallmark of the Craftsman style is a large fireplace usually located in the living room. Working as the home’s centerpiece, it often uses the same stone and wood detailing found throughout the home. As with other elements pulled from the Arts and Crafts movement, built-in cabinetry and shelving can a be found in the living spaces beyond the kitchen. More tell-tale interior details include multi-pane windows with wide trim wainscoting or chair rails, period light fixtures and paned doors. Intricate metal hardware on doors and windows add to the Craftsman charm. Craftsman homes are known for shamelessly showing off their structural components. Exposed beams on the interior and exterior of the home act as signature architectural details. As mentioned above, the ends of the beams, called rafter tails notably extend outside of the roof line. Inside, natural wood rafters accent the ceilings in most every room. This treatment brings an element interest to an otherwise overlooked aspect of the home. With locally sourced wood and stone as the go-to materials, the Craftsman home exudes an earthy ambiance. The color palette of this style reflects the natural world, as well. Earth tones like browns and greens are most often used. While handcrafted dark wood detailing and accents add to rustic influence. There are many reasons the Craftsman style home is one of the most popular across the country. It’s iconic style fits in nicely from coastal to mountainous regions. And in addition to its historic architectural beauty, the style is still quite functional in our modern world. Featuring a deep-rooted essence of comfort and hand-crafted elegance, the Craftsman home has earned its illustrative name while standing the test of time for more than a century. Most of us spend quite a bit of time in the kitchen. In the last few decades, the kitchen has evolved from a purely utilitarian space to a central gathering area for the whole family. Having a better organized kitchen will enhance not only the efficiency of the room, but also its livability factor. As the workhorse of your home, maximizing the use of every inch of its space is important. Below you will find a list with 5 effective ways that will easily make your kitchen more enjoyable. A great kitchen and an organized kitchen are one in the same. With so many items from food to flatware, having a defined place for each is a must. Beyond typical cabinetry and drawers, including a pantry for dry goods, open shelving for plates, bowls and glassware, and hanging racks for cooking utensils can bring needed order to the kitchen. Wine and spice racks are other examples of how you can increase organization, where everything is easy to find. Kitchen storage is one thing, but you’ll also need room to work. When it comes to preparing meals, the more surface areas to cut, chop, peel, dice, and clean, the better. There are many countertop options that are very durable and easy to clean. Depending on the square footage of your kitchen, a central island can provide more room to work, as well as to dine. Small desks are also a common feature in the modern kitchen. A kitchen can easily look cramped and cluttered if small appliances end up in the wrong places. While it’s nice to have coffee machines, blenders, choppers, mixers, etc., they can take up valuable countertop space. This will reduce your workspace and make the kitchen appear smaller. Establishing dedicated spaces for these appliances and storage for less commonly used machines is a recommended solution. If you want to make your kitchen appear larger, take advantage of an open floor plan. This will connect your kitchen with other living areas in your home. An open kitchen enables better interaction with family members in adjacent areas, like the living room or den. As stated before, the kitchen, especially an open kitchen, has become the heart of the modern home. Modern technology has seen incredible advances in the common kitchen appliances. Items like in-counter dishwashers, convection ovens, gas stove tops, microwaves and smart refrigerators are just a few of the must haves for any new kitchen. It’s better to spend more for high-quality kitchen appliances. They will not only last longer, but offer a broader spectrum of features that will help you save time and effort. If there’s any room in your new home that desires more thought and attention to detail, it’s the kitchen. As the most popular space in most home designs, effort should be made to create a comfortable and easily workable environment. The right kitchen can make your home. And if you ever opt to sell, a great kitchen is always a winning feature. PLAN MODIFICATIONS – DO I NEED AN ARCHITECT OR CAN MY BUILDER JUST MAKE CHANGES IN THE FIELD? Building a new home is an exciting but complicated process. What begins as simple drawings on a page, evolves into an ever-changing and growing endeavor. Because of that, anticipating the need for adjustments during the building process is paramount. Retaining an Architect throughout the whole project can be expensive, but worth the money when it comes to making big changes in the field. On the other hand, a qualified builder with a solid and detailed set of plans should also be able to handle in-field building adjustments. The following article will touch on some recommendations for managing variables during your build. If there’s one element that will set the tone for your entire home building process, it’s the building plans. Making sure your house plans are complete, detailed and correct will save you both money and time in the long run. A skilled Architect will deliver comprehensive plans that can take into account shifting build variables. Before the build begins it’s a good idea to get your builder and Architect together to review the plans and discuss any possible variations. The planning stage is where you will have the most time to make adjustments. Once the building process starts, things start to kick into a higher gear and time becomes a precious commodity. Another benefit to a well-crafted set of house plans comes into play during the bidding stage. With the details included in a thought-out home plan, builders are able to deliver more accurate bids. Square footage and floorplans are a major factor in the bidding process, but material specs and finishes are also instrumental calculating costs. A more precise timeline can also be better developed when it comes to material lead times. The term red-lining refers to making changes to an existing home plans with a red pen. This process is an easy way to record and plan for changes in the field. Sometimes these changes are taken and formally redrawn into the house plan, but more often the marked-up plans are used as is. The builder is usually responsible for red-lining. They are knowledgeable about local codes and what can and can’t be adjusted in the field. Red-lining is a cost-effective method of making changes. They can be done on-site where time is money. Making changes during a home build comes with a price. But mistakes in the field are infinitely costlier. It’s another reason meticulous and comprehensive house plans are worthwhile. While no home build happens without hiccups, open communication between the Architect and builder can help mitigate the effects of mistakes in the field. Sometimes what looks plausible on paper doesn’t always work well in the real world. Taking the initial home design through a completed build is never a perfect process. Plan modifications on site will always be a factor. The right builder can address these modifications but keeping your Architect in the loop can assist in the needed adjustments. Again, thorough house plans before the build will always result in a smoother project, but a cohesive Architect and builder team is vitally important to handling and solving variables in the field. For the home owner that needs more space and amenities, finishing out the basement is a great solution. The basement is already part of your home’s structure, so from a cost perspective it’s usually less expensive than adding to the footprint of the house. As you begin to plan the renovation, there a number of key design factors to consider. This article will highlight these ideas to help you get the most out of this exciting endeavor. Even if you just want to build out a room or two, a comprehensive plan for the whole basement is advised. Not only will it give you a full view of what you have to work with, it will make the future renovations much easier. As with any home renovation work, be sure to get the proper permits before the first hammer is swung. First and foremost, when planning a basement renovation make sure there are no water issues. Because most basements are below grade, moisture is often a factor. Solve any moisture problems before the renovation, or there’s a high probability you’ll see continuous damage to the finishes of your new space. When finishing out the walls, using insulation with a vapor barrier will aid in moisture protection. Another part of the basement renovation planning process should be a careful assessment of how each room is going to be used. Will there be bedrooms, a kitchen, theatre or a wine-cellar? Each kind of room will need the appropriate amenities. Bedrooms will need an egress window or door, closets and bathrooms, while media rooms call for special lighting and other electrical nuances. Even a small kitchen will need the appropriate plumbing. As for the utility areas like the water heater and HVAC units, leave those unfinished. These spaces need ample access for inspection and/or repairs. Since most basements are below ground, proper lighting is always an issue. Whenever possible, open areas up to natural light. This can be achieved by large windows or sliding glass doors. Recessed lighting in a drop ceiling, positioned near the outer perimeter of rooms, will provide ample light and make the rooms appear larger. Lighter color paint will also create the illusion of more light and space. Often acquainted with commercial properties, there are many drop ceiling options that look very nice in a residential setting. This design method will enable you to hide HVAC ductwork, electrical and plumbing lines. And as stated above, it’s the go-to method for recessing lights. Finishing out the basement is an efficient and cost-effective way to add much needed space and features to your home. Be sure to plan the renovation as you would the rest of your home. The extra time and planning taken up front will make all the difference in the end result. Soon you’ll be enjoying your new basement and reflecting on a job well done.